Elevators to reach upper units, no lugging suitcases up the stairs! Villa Periquito at Los Almendros in Sayulita will be your new favorite vacation home. 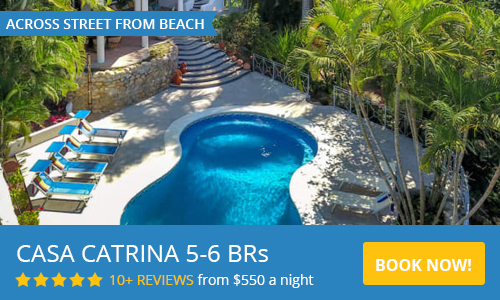 Located on Sayulita's sought after north side, with no steep hills to climb, as well as having an elevator in the complex means you won't have to carry luggage up the stairs. Just 1.5 blocks from the beach, and close to all the north side restarants and yoga. A fast and flat 10 minute walk to the center of town and main beach means you are close to everything while being far removed from the bustle and noise of the downtown area. What makes Villa Periquito a special place to stay? Each room, living room and bedrooms, are fully air conditioned, and have beautiful outdoor terraces. The living area has a folding window wall that opens to a terrace overlooking the huge swimming pool. For your enjoyment the living room has a smart TV with Canadian cable. You can watch all of your favorite shows from the US or Canada. The ample kitchen is fully equipped with everything you need should you choose to stay in and cook up that fresh catch, or simply to make fresh guacamole and cocktails. Four burner stove with oven, toaster oven, microwave, coffee maker, blender, beautiful dishes and glass ware. The kitchen includes a complete set of pots, pans and cutlery to please your inner chef. The in kitchen dining island with 6 comfortable bar stools gives you plenty of room to prepare food, dine in or hang out with the cook. If you like to dine al fresco, the terrace is a wonderful place to sit and have your meals while listening to the little parrots (Periquitos) flying by. The bedrooms at Vila Periquito are comfortable, with ensuite baths and air conditioning. The first master bedroom has a king bed with memory foam mattress topper and optional twin, opens on to a large, shaded, quiet, private patio. An elegant space with comfortable furniture, table and bar area complete with sink and BBQ. If you require a separate bed in this room, we have supplied a twin easy bed. A comfortable self inflating air bed with platform. The second master has a king bed with memory foam mattress topper and built in twin. It has its own small terrace of its own, with a table for two and a view of the pool. You can hear the crashing waves from both bedrooms and terraces. Each bedroom has a beautiful en suite bath with custom tile. For the beach Villa Periquito provides two large beach umbrellas, two Tommy Bahama beach chairs and several other folding chairs.Periquito currently has WiFi from the common area and we are in the process of installing high speed fiber optic internet. This will allow you to have a working vacation if you require it. No dishwasher, but with the daily maid service, you do not need it! Follow the winding path to Villa Periquito. First floor of building three with an ELEVATOR! No need to carry your things up the stairs. All of this and the best pool in Sayulita, 24 hour security and a block and a half to the beach! Villa Periquito is on the quiet north end of town. The heart of town with its wonderful restaurants and shopping is a 10 minute stroll away. Please use the contact form to get in touch, by email or telephone, with any questions and to book your stay. 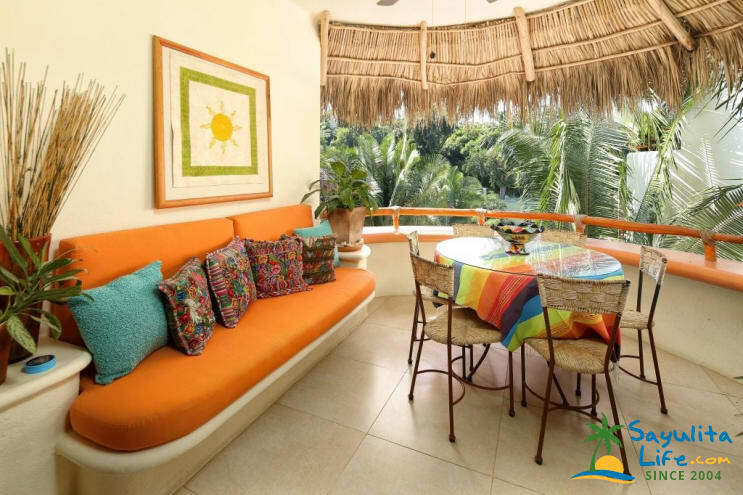 You will love Villa Periquito in Sayulita!